Adonis know the maritime business world inside and out. Through the years we have handled challenges and developed software that works. Systems and technology have changed. 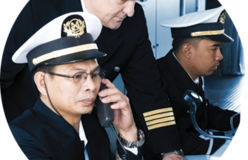 As a supplier to some of the most demanding, market-leading maritime suppliers, we must keep up with the fast moving progress and play by its rules. This is why we say that Adonis comes with built-in experience and competence! Our user interface is familiar to anyone who uses a computer. At first sight one can appreciate that it follows the same principles as Microsoft Office©. With a well-known graphical user interface, basic user training can be reduced to a minimum, while the work processes can be given maximum focus. We offer in-house an web-based training to ensure all users the pleasure of a full Adonis System experience. Move to a world without costly installations, network issues, server trouble and all the familiar technical hazzle you know from previous implementation projects. With the Adonis Cloud Solution you can put all these concerns aside and focus on your processes. The simple technical platform of Adonis allows us to have your system ready to be up and running in the cloud in a minimum of time.